Book Drunk: Review ~ The Night Falling by Katherine Webb. Review ~ The Night Falling by Katherine Webb. Publication Date: November 20, 2014. Leandro Cardetta, born into poverty, emigrated to America to make his fortune and has returned home to southern Italy a rich man, accompanied by his glamorous wife, Marcie, an ex-showgirl fighting middle age. Now Leandro has money enough to hire renowned English architect, Boyd Kinsgley, to renovate a crumbling palazzo into an Art Deco statement of wealth, and host Boyd's teenage son and his diffident young second wife, Clare, for one extraordinary summer. Under the burning sky, beyond the luxury of Leandro's home, tensions are high. Veterans of the Great War are desperate for work and food. Among these is Ettore, Leandro's nephew. Gripped by grief at the loss of his fiancee, Ettore has sworn to identify Livia's killer, and take his revenge. He is too proud to go to his uncle for charity, but when he injures himself one day, he has no choice but to knock on Leandro's door. Meeting Clare there will change everything - and in the most violent way. During the fierce summer of 1921, all these lives converge. Exactly how did Leandro grow rich in America, and what is the strange hold he has over Boyd? What happened to the first Mrs Kingsley, and what secret haunts the outwardly exuberant Marcie Cardetta? Hearts will be broken, blood will be spilt and the hardest of life's lessons will be learnt as shadows fall. 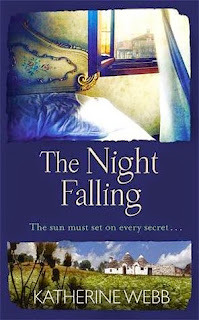 The Night Falling is a little different to the kind of books I normally read but I had no reservations – I’d heard wonderful things about Katherine Webb’s writing and I couldn’t wait to start reading it for myself. This book was truly incredible. In what should have taken me probably a good few chapters to get to grips with, considering I’ve not really read much about poverty or war before, Katherine Webb had me entranced within the first couple of pages. The level of detail and description to kick off this novel was beautiful and powerful and every page to follow was emotional and heart-wrenching. It was so stunning and I really did not expect to fall for this novel as much as I did but it was such an impacting read. I put down this book more times than I do most novels but only because I needed to take it in and appreciate what I was reading more, and in the hope that the more times I put it down, the longer I could delay it coming to an end. The Night Falling had me spellbound. Set in 1921 Italy, the novel focuses on the perspective of two main characters, Clare and Ettore. Ettore is a peasant, returning from the war. Faced with an injury, he has to begrudgingly turn to his uncle Leandro for his support and this is where he meets Clare and her stepson Pip. Clare is battling her own issues, as her marriage to Boyd is under scrutiny, to say the least. But we also learn about Ettore’s plans to avenge the death of his fiancée, Livia, and with this see that each character has their own spectacular story. Although this book is separated into Clare and Ettore’s chapters, the author creates and develops many more characters than that and Katherine’s writing of characters is insanely good. There were no real outright likeable characters – each had their good and bad traits – and I loved the way the author built up every single character to the extent that nothing was black or white. It wasn’t so simple as having characters that would do no wrong and characters that would do everything wrong and this made it much more entertaining attempting to figure out their motives, whether they were being honest or not and the role they were playing in the at times extraordinary turn in events. The characters, just like the setting, the descriptions and in fact the entire novel, were vivid and felt very realistic. The way the author manages to bring out the emotions in every single character was amazing to read because you can connect with them, even though what they are doing might disgust you or confuse you, you feel for them and need to know how things will work out. The Night Falling was completely captivating and the author’s style of writing told me that all the great things I’ve heard about her are true! Her portrayal of the poverty and the contrast between the wealthy and the poor was stunning and I was fascinated by how she conveyed every feeling and judgement and all the tension that came with the divide. We’re shown how living in those times could change even the most innocent of characters and I was completely absorbed seeing the impact on each character and the changes in them that occurred over the space of the novel. There is so much to this book that meant there was plenty to be uncovered and I was hooked with all the secrets and deceit. Though the writing could be brilliantly dramatic, and I loved it for that, a lot of the twists were hinted at and then took me by surprise and the unpredictability kept me in suspense right up until the final page. This book had everything – it could be horrifically violent at times, passionate at others and ultimately breath-taking throughout. The ending, as much as I didn’t want it to come, was a great way to finish what was a fantastic book and oh how I must get my hands on Katherine Webb’s other books now because The Night Falling was just perfect. Now this is a book I would enjoy. I'm going to have to stop reading your reviews as my list is so long. Must be great if 5 hearts. Review ~ Ignoring Gravity by Sandra Danby. Review ~ The French for Christmas by Fiona Valpy. Review ~ A Christmas to Remember by Jenny Hale. Review ~ The Blood-Dimmed Tide by Anthony Quinn. Review ~ This Christmas by Katlyn Duncan. Tammy Cohen on 'Creating a Villain'. Review ~ The Christmas Spirit by Susan Buchanan. Review ~ Equinox by Dirk Strasser. Review ~ The Boy Who Loved Rain by Gerard Kelly. A Day in the Life of Anthony Quinn. Review ~ The Oyster Catcher by Jo Thomas. Review ~ Three Little Birds by Carol E. Wyer. Review ~ Home For The Holidays by Ellen Faith. Review ~ The Star Catcher by Stephanie Keyes. Review ~ Fairy Tale in New York by Nicky Wells. Review ~ Mishaps & Mistletoe by Tilly Tennant.